View Poll Results: Would you like / use this feature? The big problem with plug-in parameter automation is the inability to set a target range of values. A MIDI CC value of 0 sets the parameter to its minimum value and 127 sets the parameter to its max. Good control of a smaller range (of, for example, a frequency or gain or pitch value) is almost impossible. 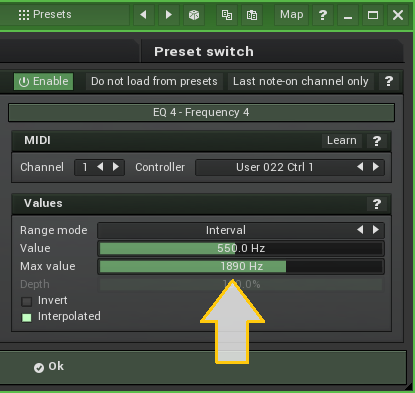 The band frequency in all 4 plug-ins is controlled by the same MIDI CC#. The first screenshot shows the parameter for a CC value of 64, the second for a value of 0 and the third for a value of 127. 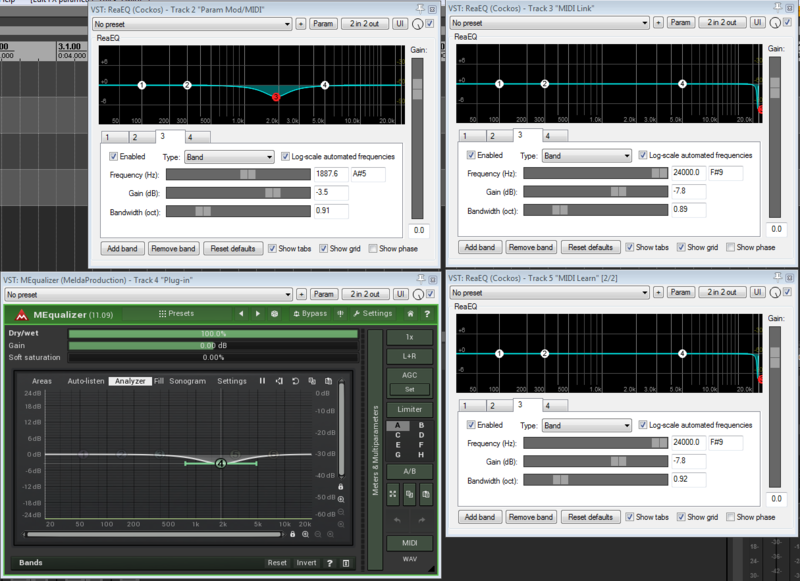 The 2 ReaEQs on the right-hand side are controlled by "MIDI Link" and by "MIDI Learn / Parameter Automation" respectively; as you can see the parameter moves through its whole range from 20Hz to 24,000Hz. The ReaEq on the left uses "Parameter Modulation / MIDI with some non-intuitive (to me) Baseline and Scale settings to get close to controlling the desired frequency range. And MEqualizer uses its built-in feature to control the precise range (550Hz to 1900Hz). 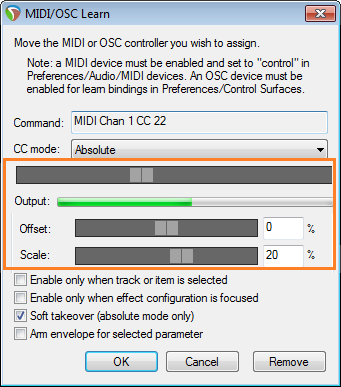 The next step would be to change the Baseline / Offset and Scale Settings in both windows to more intuitive controls; Minimum and Maximum, perhaps, displayed in the target parameter values, not %. Last edited by DarkStar; 08-06-2018 at 07:04 AM. I think mixing "MIDI Learn" with "Parameter modulation" is a bad idea. The first is Reaper "quick DAW control with HW Surface". The second is "performance" way, the same as with SoftSynth. It just extend the possibility to do what many plug-ins have internally to any plug-in. * all controlling will be limited to the range and the curve, including "MIDI Learn", other Control Surfaces (MIDI, OSC, Web) , knob on the track, etc. With "0% - 100%" things are historically complicated. VST has no function to get the text for arbitrary parameter value, only for current parameter value. Some DAWs try to "deduct" the text using one or another approach, but results are so to say "unstable". I have found setting modulation parameter range relatively easy: set MIDI to 0, adjust Baseline, set MIDI to 127, adjust Scale. 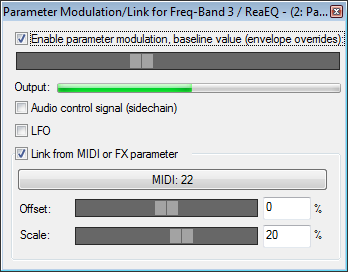 The first ReaEQ is controlled by parameter automation and the second by MIDI Link (with a baseline and scale set). The MIDI CC events (values 30-96) on track 1 are sent into the "ReaControlPath by Jeffos's plug-in for the first ReaEQ and are Sent to track 3 for the second EQ. As you can see I have fine control over a small range of frequencies in the MIDI_Linked EQ but not in the Parameter-automated one. isn't this related and benefit this topic?